Description: A vindictive Northern fantasy on the aftermath of the Civil War. 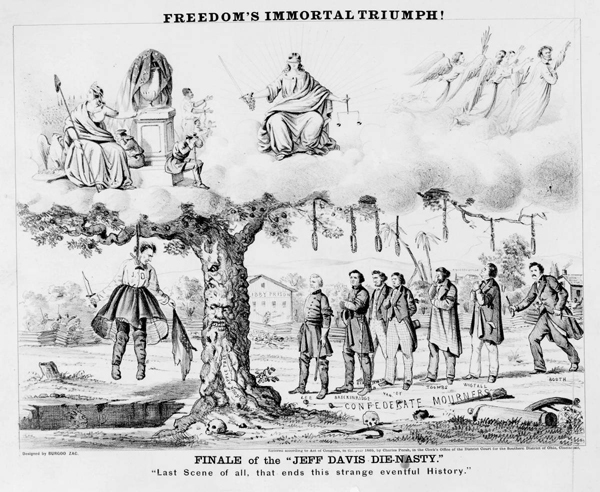 Confederate president Jefferson Davis, dressed in a hoopskirt or crinoline, hangs from a “Sour Apple Tree” at left, a Bowie knife in one hand and a torn flag in the other. (For Davis’s costume, see “The Chas-ed “Old Lady” of the C.S.A.,” no. 1865-11; for the “sour apple tree,” see “John Brown Exhibiting His Hangman,” no. 1865-16.) Beneath Davis is an open grave from which peers the devil. At right nooses are suspended over the heads of several “Confederate Mourners” (left to right): Gen. Robert E. Lee, Secretary of War John C. Breckinridge, Secretary of State and War Judah P. Benjamin, one of the Southern “Fire-eaters” and member of the Confederate Senate William Lowndes Yancey, Georgian Robert A. Toombs, and Louis T. Wigfall. Lincoln’s assassin John Wilkes Booth (far right) rushes to join the group. On the ground lie copperheads (symbols of Peace Democrats), skulls, and broken artillery. The infamous Confederate prisons, Libby and Andersonville, can be seen in the distance. In the upper register the blindfolded figure of Justice, holding a sword and scales, is enthroned on a bank of clouds. At left Liberty sits beside an urn partially covered by the Union flag. An eagle is beside her. A grieving soldier and sailor attend the urn, while a slave man, his wife, and child look toward the far right, where the recently assassinated Abraham Lincoln is escorted heavenward by angels.